This two-chambered, liquid-fuel rocket engine served as the booster for the Navaho missile, which was powered by two ramjets. The huge, vertically launched intercontinental cruise missile was designed to strike a target up to 8,850 kilometers (5,500 miles) away. However, the Navaho never became operational. Its unsuccessful testing program and enormous development cost, which had reached almost a billion dollars, caused the program to be cancelled in 1957. 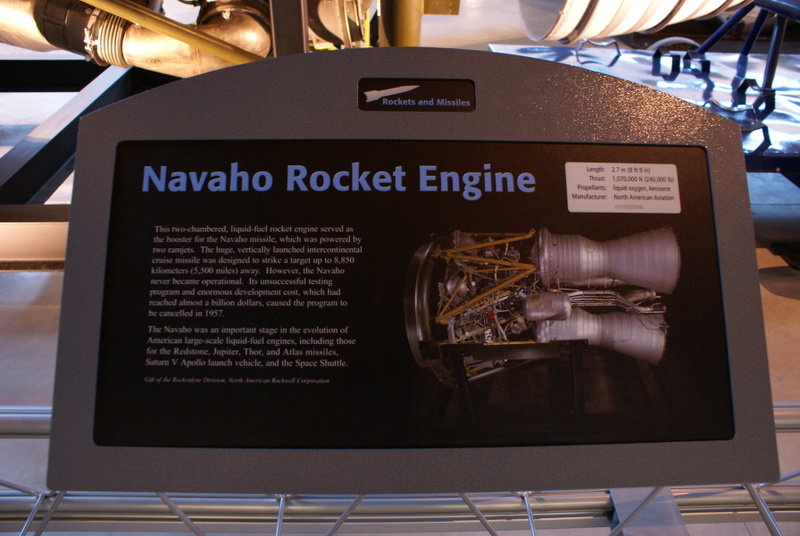 The Navaho was an important stage in the evolution of American large-scale liquid-fuel engines, including those for the Redstone, Jupiter, Thor, and Atlas missiles, Saturn V Apollo launch vehicle, and the Space Shuttle. Although this sign indicates that the engines used RP-1, most sources list the fuel as alcohol. Launch photos also show rocket exhaust more typical of alcohol than RP-1.